Obo is a community composed of far more people than those you would find in the town itself at any one time. Historically they spent much of their working ages in the satellite villages on Obo land. That was necessary as the amount of food needed to feed the whole population was greater than the amount which could be farmed within a day's walk from the town. The nucleated settlement needed the satellites to survive. 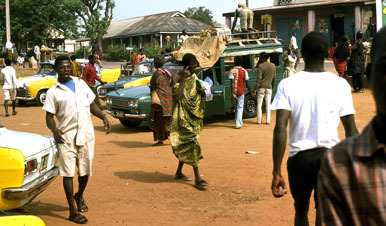 From early days, that dispersal also included long distance treks, both north and south for trading, and Obo people, like others in Kwawu, developed a reputation as successful traders. See Map. With the growth and expansion of the capital city, and then many regional and district towns, the life cycle temporary absence from the home town, during the working years, became adapted to the needs of urban life. Today Obo people can also be found in the UK, other countries in Europe, in the USA and Canada. They continue to maintain their ties to their home town, and Obo swells annually during the Easter holidays, and with the large funerals of important members of the community. To a lesser extent, and because of increasing European and North American cultural influences, Christmas is also growing as an annual time for home town returns. Because of the residual importance of ancestor homage, however, Easter remains by far the most important even for home coming. This page shows various forms of travel. and will be expanded as I scan more slides taken during my PhD research. Ghana has an international airport at Accra. It also has a domestic service which serves the major towns of the nation. 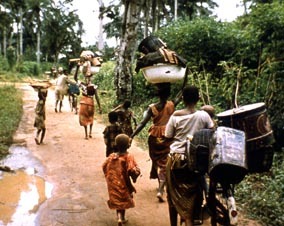 I spoke with old men and women in Kwawu who could remember walking to Accra when they were younger. The trip took about six days. Meanwhile, canoes were used on the Afram River, to the Volta River, to the coast, and a foot path followed the edge of the Afram. 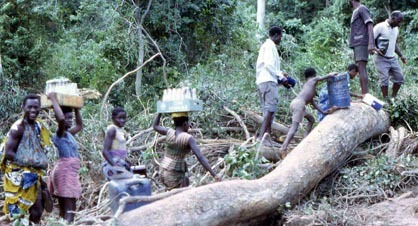 A shrub in the forest, called the nkyenkyema, has weak roots. It often falls over and blocks the path. 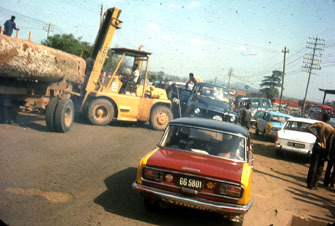 In the early seventies, after a restriction against importing vehicles, the import rules changed, and a large number of new vehicles came onto the roads. Drivers of the new vehicles were impatient with those of the old ones, which could not keep up to speed. 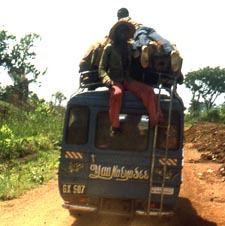 Some driver coined the word "kyenkyema" to describe slow and decrepid vehicles that held up the rest. Later the word expanded to refer to anything old and decrepid, and I heard old women describing themselves as kyenkyema. 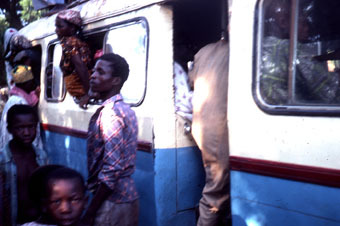 When the train from Accra to Kumasi was built, Nkawkaw, on the lowlands south of the Kwawu Escarpment (a non stool village satellite of Obomen, under Obo in the Nifa division) grew rapidly, and the Afram River route on the North side of the escarpment died as a major route to the coast. 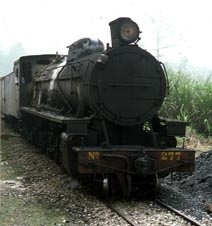 Several train photos are available on the Railway page. Now that the railways are no longer functioning, transport between Accra and Kumase, through Kwawu, is almost entirely by road. Air traffic bypasses Kwawu. 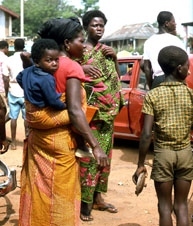 The word "mammy" (from the Twi word, mame) is a respectful term, usually referring to the wealthy women who control the trade in food and retail products. 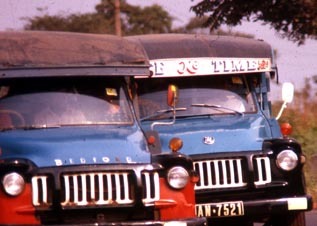 At one time these transport trucks (lorries) could be seen everywhere in Ghana. 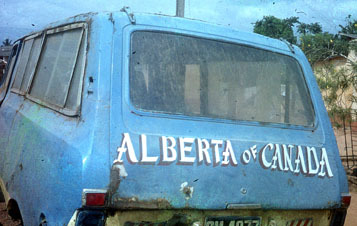 Prior to the ports being built at Takoradi then Tema, the Bedford frames were imported from the UK, brought to shore on the surf boats. 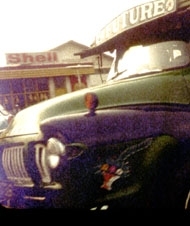 The diesel engines and steel frames had good reputations, strong as tractors, and reliable. The owners, often wealthy traders, men and women, would contract with carpenters to build the box, seats, roof (tarred to be waterproof) and canvas flaps for the sides and back to use when it rained. Like the surf boats along the coast, they were often decorated with favourite proverbs, or acknowledgement of a father or uncle who set up the owner with an income by financing its purchase. 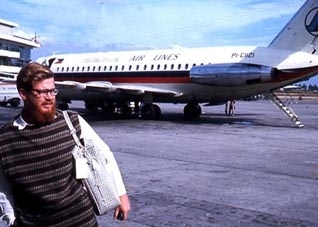 They carried passengers and freight (including live animals), usually in the same trips. 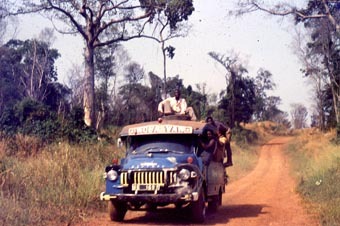 Since the seventies, inexpensive new and second hand vans from Japan and Korea have been imported, and the mammy wagons are now usually seen only in the remote rural areas. 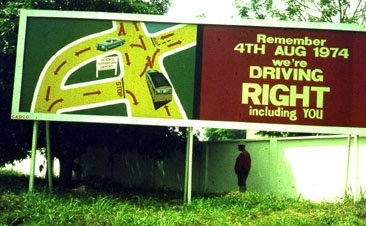 In 1974, Ghana moved from driving on the left to driving on the right side of roads and streets. There was so much publicity, on the radio, in all meetings. The slogan in Twi was "Nifa, Nifa Enan." (Right, Right Fourth). 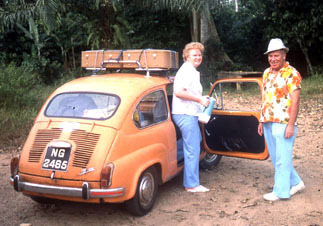 No cars could be imported with steering wheels on the right side from 1972. The day of the change, children would taunt drivers who forgot (calling out the slogan from the side of the street). The accident rate went down to close to zero and stayed there for six weeks. Because of the tsetse fly, cattle do not survive in the rain forest. Much of the beef eaten in the south of Ghana, therefore, walks hundreds of kilometres from the north to the south. Since cows are not known to observe road courtesy, it is a common occurrence to have to wait to get through a herd walking south. Because of the delays on the road, local pundits have named them "traffic inspectors." On the lowlands south of the Kwawu Escarpment, Nkawkaw is a regional transportation hub. While the railway was running, it was a major stop. 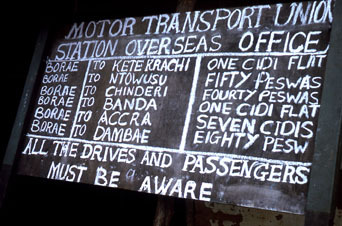 It is a major stop for coach and bus travel between Accra and Kumase. The Nkawkaw lorry park, therefore, is a hub for travel to all parts within Kwawu: up on the escarpment, over on the northern slopes to Afram lake, and on the southern lowlands. 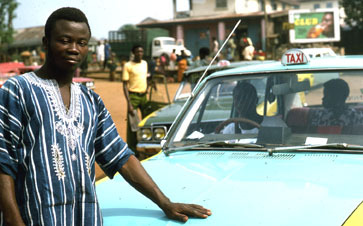 Taxis are identified by having yellow "wings" (fenders). Seldom are they used by a single passenger going to a single location. 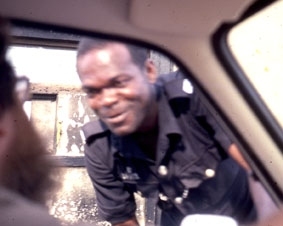 Rather they operate in a manner similar to the lorries, filling with passengers and taking them all to one location or along a specified route. 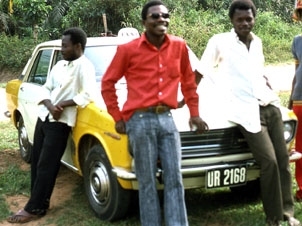 This photo was taken prior to Ghana driving right in July 1974. 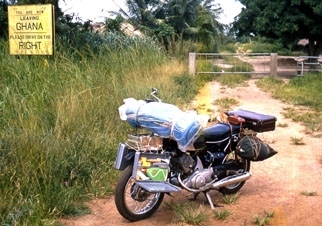 (The sign warns to drive on the right in Togo). 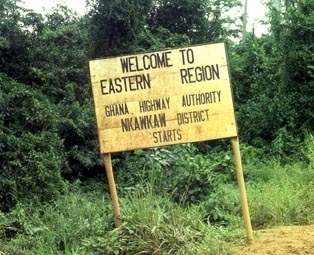 The border was not very formal in rural areas such as this, a hundred kilometres north of the main international road between Ghana and Togo. Today, 2004, about 1800 cedis are needed to make one dollar, but in 1973 a cedi was worth about $1.20. The word "cedi" in Twi means "cowry," as the cowry shell was used as currency prior to the introduction of modern currency. 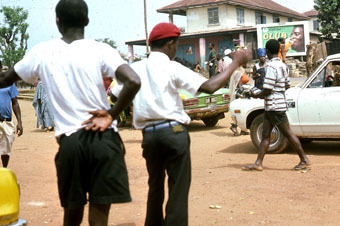 At independence, 1957, Ghana dropped the British pound and shilling in favour of using the cedi. 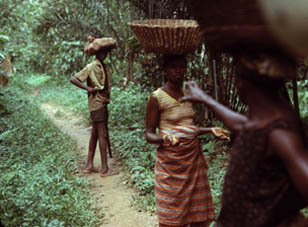 (Today the cowry shell is used almost exclusively as part of the paraphernalia of the traditional traditional clergy). 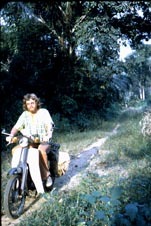 I had three motorcycles during the twelve years I spent in Ghana, Hondas 50, 150 and 250. 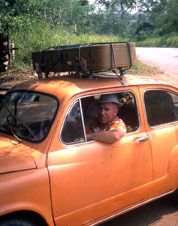 I also had a Volkswagen sedan for some time, and often took local transport and the train.